On a daily basis at our dog obedience training facility in Northern Virginia, we work with dogs so they stop running out of the door. This is what we call “door manners.” In my opinion, teaching your dog door manners is essential for numerous reason, you will see I discuss this in my blog on Pack Leadership. Pack Leadership: It teaches your dogs that you are the first one to do everything. You go inside first, you go outside first, you go up the stairs first, you go down the stairs first, etc. This is a very simple thing you can do to help show pack leadership with your dog. As I explain to our clients, “You never see pictures of ducks lined up and the mother is in the back of the line. You never see packs of lions and the biggest alpha lion is behind all of the small ones.” Why? Because it’s very basic pack leadership, the alpha male and dominant member is always in the front. Manners: Doing door manners does just that, it teaches them manners. There are few things I hate seeing more than a dog literally almost knocking someone down trying to go out the door before them (or in the door). This should never be acceptable for you or your dog. Safety: By doing door manners, you have taught your dog that “just because the front door opens, does NOT mean you are free to run out it.” So, when you incorporate door manners in your obedience training they become desensitized to the door opening; therefore, it prevents them from running out it like many dogs do. Did you know that in 2012, approximately 1.2 million dogs were killed from being hit by a car? Many of them from running out of the front door or chasing something into the street. ANYONE who has trained with us, has seen us incorporate the door manners into our training, we literally do this with every single dog we train. That’s how important door manners is to us, we do it with 65 dogs per week. I have included just a few clips of our door manners training in the video below; however, if you look at our YouTube Channel, you will literally see this in over 200+ of our videos. If you do not have access to a really good obedience training program, this is something you can start doing at home on your own. Put your dog into the sit position and “slowly” open the door, as soon as he jumps up, shut door and put him into the sit again. Repeat this until you get the door all the way open, then release him. If you do this “every single time” you come to a door, I can assure you within a few days you will see a huge difference in your dog’s door manners. Initially, you will feel this is very tedious, because they will probably get up a lot; however, just stick to it. Each time you do it, you will find that you are having to make them sit less and less. Training a dog to heel is one of our most requested and needed commands at our dog training facility in Northern Virginia. We currently have over 430+ Before/After videos on our Youtube Channel, most of these videos show dogs we have trained off-leash heeling with distractions. The picture above is me working a Belgian Malinois on a focused heel, this is an advanced form of off leash heeling, where the dog stares at you the entire time they are heeling. Correction: In order to get a solid military/police precision heel, I am a believer that with the vast majority of dogs, there has to be a correction for the unwanted pulling; however, the correction is delivered is based upon your dog training program that you are enrolled in. You can read about the different dog training methods here in my blog, “The Pro’s and Con’s of Different Dog Training Methods.” As I say on a daily basis, “I have never seen a dog (or a child) that has impressed me in obedience that did it solely through a reward-based program.” Military dogs, police dogs, and ring dogs are the most confident and obedient dogs in the world, none of them solely use a reward-based system. Pick A Side: Pick a side on the left or right and stick to it! Our dogs we train to heel on the left, NO EXCEPTIONS. Never on the right, never in front, never behind, always on the left! Consistency is the key! It’s much easier for them to learn to always heel on the left, no exceptions, than to learn to “generally” heel on the left, but sometimes on the other side, too! Pace: I am a huge advocate of what I call “pace-variation.” If you watch our numerous videos, you will see me heeling a dog and walking at a fast pace, and then suddenly I will walk at a very slow pace and you will see the dog automatically adapt. Then, I will repeat this; walking normal, speeding up, slowing down, etc. This teaches the dog that irregardless of whom is walking them, they have to modify THEIR pace to that person, not the other way around. You can see a great example of this pace variation in this 140lb uncontrollable Great Dane that we trained. Direction: As I tell our clients on a daily basis, ensure YOU also control the direction of the walk; meaning, never change the direction you are walking in order to adapt to your dog. For example, if your dog pulls you to the left, most owners will go to the left to accommodate the dog, this is wrong. You keep walking in the same direction that you were going and make your dog adapt to your direction, not vice-verse. If your dog pulls one direction and you go that direction, you simply taught your dog that they are a steering wheel and whichever way they pull, you follow. You can see owners that have adapted their direction to accommodate their dogs in these before/after videos. Avoidance Behaviors: An avoidance behavior is something that your dog will do in order to help control the walk or the breaks during the walk. Some of these avoidance behaviors are stopping and sitting as you are walking them, marking on everything, lying down, stopping and scratching, etc. These are all things that owners allow their dogs to do during a walk, which teaches the dog that they can control the starting and the stopping of the walk. Never let your dog control the walk with avoidance behaviors, if we are heeling a dog and they stop (by marking, sitting, scratching, etc), we simply correct them and keep walking, NOT changing our pace whatsoever. Anyone who has worked with me onheel lessons at my dog training facility in Northern Virginia, has undoubtedly observed me doing this. I will be working the dog on a heel, the dog will stop, sit, and start scratching (for example), I correct and just keep walking at the same pace and in the same direction without skipping a beat. Again, “I” control the walk, not the dog. Consistency in Leash Length: This is something that most people do not consider, even most “trainers.” If you are giving your dog a correction based off of when they create tension on the leash (which is the proper way to do it), THE LENGTH OF LEASH THEY HAVE SHOULD ALWAYS BE THE SAME! Amazing concept, right? You cannot correct your dog based off of them pulling on the leash, yet the amount of leash you give them changes every time you walk them, your significant other walks them, etc. In order to TRULY make it fair and easy for your dog to understand, they should always have the same amount of leash between your hand and their collar. We tie a knot in the leash to ensure every time we heel the dog, we are giving them the same amount of leash as last time. Opposition Reflex: Whatever the dog does, we do the opposite to counter it. If they slow down, we speed up and correct. If they speed up, we slow down and correct. Patience: Every single day we hear people say, “My dog doesn’t heel with with distractions.” We then see their dog, and their dog doesn’t heel with WITHOUT distractions. Or, “My dog cannot off leash heel,” and then we see their dog and their dog isn’t good at ON leash heeling. So, you dog should literally be flawless at on-leash heeling before you even consider distraction work or off leash work. If you are having a lot of trouble with your dog on a walk, find a qualified trainer in your area that can assist you with getting your dog’s heeling perfect! We deal with leash aggression in dogs weekly at our dog training facility in Northern Virginia. An important study to first reference is one which was recently done on 2000 dogs at Mendel University in the Czech Republic. In 2000 dogs of varying breed, age, and size; researchers noted that dogs who were ON a leash were twice as likely to become aggressive with dogs as dogs who were off leash were. -The on leash dogs were restricted by the confines of the leash, which inhibited their ability to circle around the other dog, get a “feel for them,” and give them a proper greeting in order to determine if they were friendly or not. When the dog is not able to determine this, they often times gave a defensive posture since they could not establish the other dog’s intentions. -Flight or fight. When a dog isn’t sure how to react in a certain situation (just like with people), flight or fight kicks in. By being on a leash, you are restricting your dog’s ability to flight, so he immediately kicks in fight mode with an aggressive response. It’s also important to note that the 2000 dogs were FOUR times as likely to be aggressive on a leash when a male was walking them as opposed to a female walking them. Many would assume the opposite because many would see the male as more the pack leader and in-charge, but they believe the reasoning is far more simplistic than that. Women are often more friendly and inviting to passerby’s and their dogs. Meaning, often times when will smile, say hello, and exchange pleasantries with the oncoming person and their dog. They believe the dog picks up on this nice, calm, friendly demeanor from the owner, so they too feel more relaxed and at-ease with the situation. Whereas men are more macho, not as socially friendly, and not as warm greeting with strangers as women; therefore, when someone is approaching, the men often times will just not pay attention to the oncoming person and their dog, avoid eye contact, no smiling (etc) and the dogs can interpret this “avoidance” as a problem and go on the defensive with the oncoming dog. What Can You Do To Help With Your Dog’s Leash Aggression? –Obedience Training: This is essential, having control over your dog, pack leadership, confidence building, and correction for negative behavior. All of these are things that will undoubtedly help with your dog’s leash aggression. -Be aware of your surroundings. When you see a stranger and their dog approaching, be friendly, polite, warm, and welcoming. This can help you translate your warm and relaxed demeanor onto your dog. –Pack Leadership. Letting your dog know that you are in control of the situation and them controlling the situation is not necessary nor needed. -Try to give your dog proper space for interaction with the other dog so they do not feel confined and do a proper introduction. -Watch the other dog’s body language. You may be able to avoid a bad situation just by YOU being observant and see if the other dog appears to have good or bad intentions. What does it mean that dogs are pack animals? This means they always roam and stick together in a pack. Lions are the same way; you will very rarely see a lone lion because they travel in packs. Anytime you have a pack, there has to be a leader in charge of the pack. Think about a pack of dogs like a small business in America. There is no successful business that does not have someone in charge of it. There has to be someone in charge in order to make the decisions, ensure the employees are taken care of and have everything they need, reprimand an employee when he or she does something that goes against the policy of the company, and ensure the overall success of the business. The pack leader, or “alpha-male,” of a dog pack essentially has those same responsibilities. Many people wonder why this is important. This is another very important process to ensure that you have a happy, confident, and well-trained dog. Dogs are much happier and stable when they know their place in a pack, and there is no question about who is the dominant individual in the house. As some of you may have already experienced by having dogs, people often say, “My dog listens to my husband really well and does not listen to me at all.” Or “My dog will listen to my husband and me, but he will not listen to the kids.” Again, this is because your dog knows whom the pack leader is, and listens to him or her. Generally, the person the dog listens to the best is the one who has displayed the best pack leader characteristics and he knows that person is in charge. We are going to discuss many things you can do in order to show your dog you are the pack leader. One of the most basic things that I always stress to people during their puppy consultations at our dog training facility in Northern Virginia is: Do not let your dog get on the furniture. This is something a lot of people do not like to hear. However, this can and often does lead to major problems in the future. One of the problems with letting your dog get on the furniture is you are bringing them to your level. Essentially, you are teaching them they are on the same level as you and your family. Remember, dogs should be treated as the lowest members of the pack, not as equals. Having them sleep on the floor and on their dog beds is just one more thing to reinforce to them that they are lower members of the pack. Hence, they get the lowest and worst spots to sleep and lie. Another problem that can be caused with letting them get on the furniture is territorial aggression. I have talked to many clients who tell me that if they try to get their dog off of the couch, he will growl and snap at them—again, because now the dog sees this as an invasion of his space. I have talked with numerous people who tell me that when they try to get into bed with their significant other, their dog will growl at them. Again, by bringing them to your level, you can create numerous problems with the order of your pack. You are demonstrating to your dog that he is equal to you; this can lead to many problems. You should be the first one to do everything. What exactly does that mean, you ask? You should be the first one to eat, then you feed the dog. You should be the first one greeted when a family member arrives home, or if you arrive home first, the family members should be greeted and then the dog. Again, you are reinforcing to him that every member of the family is higher on the pack structure than he is. You should be the first one out the door and the first one up or down the stairs. Simply put your dog in the sit position and then allow him to come after you have gone, or hold him back so he cannot pass you. While walking on the leash, your pup should walk beside you, not in front. Again, leaders walk in the front of the pack. Just keep in mind when you start to work with your dog that you and your family should be the first ones to do everything. The dog always comes last. In military and law enforcement, generally, our dogs do not have any toys that belong to them. This is done for two reasons, one of which I discussed earlier: Your dog will never be motivated for something to which he has constant access. The second reason we do this is to show the dog that he owns nothing; all toys are ours, and he plays with them when we allow him to. He gets them for doing something good, the toy becomes the treat. Many dogs become toy-aggressive because they have learned that the toys are theirs and you are trying to take their toy. Again, you are the leader, so you control everything in the house. Just like my father was our pack leader, so he controlled the remote control, and he only let us have access to it when he wanted to. Just one more small thing of the many that reaffirmed he was indeed the leader of our household. Get in the habit of touching and playing with your dog while he is eating, or has a bone or a toy. This is done to desensitize them to any possession issues that could arise in the future. Again, they learn that you give the food, toy, bone, or ball, and that you can take it away; it is yours and you are just letting them temporarily have it. Another important thing about which I get asked about is when dogs try to force their owners to play with them or pet them. For example, you are sitting on the couch and your dog comes over and drops his ball in your lap or lifts up your hand to make you pet him. Those are both examples of your dog trying to make you interact. As hard as it may be, never give in to this forced interaction. Once you give in, your dog will always try to force you to interact. If our dogs do this, we simply pay no attention to them. They learn that their efforts did not pay off and they will no longer try to engage. If you feel you must give your dog a toy, and he keeps dropping it in your lap or next to you, simply put away the toy. This shows them that by trying to force you to play, they lost their toy. Again, they will stop doing this because they will equate this action with getting their toy taken. We teach the dogs that we decide when it’s time to play, not them. Never feed your dogs from the table. This is a common mistake. If you do this, you will have a dog that begs, drools, and stalks you and your family at the table. By handing them food from the table, you are teaching your dog that the table is a great source for amazing food. Imagine if every time you hung around the table, your father offered up $100. How much would you be waiting at the table? Your dog has the same mindset as you. If you feel compelled to give your dog table food, wait until everyone from the family has finished and gotten up from the table. Then you can place some of the leftovers in your dog’s bowl. By doing so, you are teaching that food never comes from the table and it will only come from his bowl. Make your dog listen. 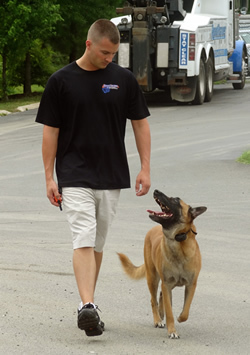 I always tell our clients when doing our training in Northern Virginia, “Never give your dog a command that you are not going to reinforce.” That is one of the most important things when it comes to advanced training. If you give a dog a command that you know he knows, you must follow through with it and make him do it, with no exceptions. If you tell him to sit, down, or come, you must ensure he does it, even if you have to physically make him do it. Your dog must learn that once you issue a command, there is no way out of it. Just like with kids, if you let them get away with not doing something you told them to do once, they will try to get out of it the next 10 times. I always tell my clients, “You will never hear me tell a dog something that he doesn’t end up doing. Once I say a command, it’s not if he will do it, but whether they do it on their own. Otherwise I will make him do it.” To me, this is an essential principal in training and being the pack leader. If my father told me to clean my room, it was getting done and there was no way out of it and I knew that, so I rarely even tried to get out of it. Apply those same principles to training your dog—if you cannot back it up, don’t give the command.